Gradually over the nineteenth century, “Hall of Independence” or “Independence Hall” became the common name for the old Pennsylvania State House. The east room on the first floor, where independence was declared, served as a place for welcoming honored guests to the city and exchanging greetings that honored the room’s historic significance. “My entrance through this fair and great city amidst the most solemn and affecting recollections, and under all the circumstances of a welcome which no expression could adequately acknowledge, has excited emotions in my heart in which are mingled the feeling of nearly fifty years. “Here within these sacred walls, by a council of wise and devoted patriots, and in a style worthy of the deed itself, was boldly declared the independence of these vast United States which, while it anticipated the independence- and, I hope, the republican independence of the whole American hemisphere- has begun for the civilized world the era of a new and of the only true social order founded on the inalienable rights of man, the practicability and advantages of which are every day admirable demonstrated by the happiness and prosperity of your of your populous city. “Here, sir, was planned the formation of our virtuous, brave, revolutionary army, and the providential inspiration received that gave the command of it to our beloved, matchless Washington. But these and many other remembrances are mingled with a deep regret for the numerous contemporaries, for the great and good men whose loss we have remained to mourn. It is to their services, sir, to your regard for their memory, to your knowledge of the friendships I have enjoyed, that I refer the greater part of the honors here and elsewhere received- much superior to my individual merit. From Ellis Paxon Oberholzer, Philadelphia, A History of the City and Its People (Chicago: S.J. Clarke Publishing Co., 1912), 137. Auguste Lavasseur, Lafayette in America in 1824 and 1825, translated by John D. Godman, vol. 1 (Philadelphia. Carey and Lea, 1829), 141-43. On a plain a short distance from the city, General Lafayette was received by the civil and military officers, and about 6000 uniformed volunteer militia, drawn up in a hollow square, amid the thunder of canon. … Never could it be more truly said, that a whole population came out to meet Lafayette; more remained at home but those whom age and feebleness detained. Stages had been erected on each side of the streets, as high as the eves of the houses, for the accommodation of spectators. 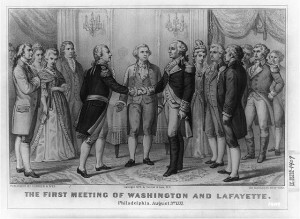 In the principal street of the suburbs by which we entered, the different trades were drawn up in a line, at the head of each corps was a workshop, in which were workmen at their employments; a banner accompanied each of these workshops, containing portraits of Washington and Lafayette, with this inscription, “To their wisdom and courage we owe the free exercise of our industry.” The printers were the most remarkable among all these mechanics. Over a press which they had in operation in the open street, was the following inscription, “Liberty of the Press, the surest guarantee of the rights of Man.” From this press, an ode to Lafayette, written by James N. Baker, was thrown into the carriages and among the crowd, as they passed. After the mechanics, followed the public schools, the masters and scholars all being decorated with a ribband bearing a portrait of the general and the motto “Welcome Lafayette.” At the head of the procession marched a detachment of cavalry; the nation’s guest followed in a magnificent barouche drawn by six horses, and by his side was placed the venerable Judge Peters, who was the secretary and soul of the war office throughout the revolutionary struggle. Then followed the mayor, city council, and judges, in different carriages; then George Lafayette and myself in a barouche, and behind us four large open cars resembling tents, containing each forty revolutionary soldiers. No one could, without emotion, behold these veterans of liberty, whose eyes half extinguished by age, still poured fourth tears of joy at their unexpected happiness, in once more beholding their ancient companion in arms. Their feeble and trembling voices were reanimated by the sounds of the martial music, which accompanied them, and acquired a new vigour in blessing the names of Washington and Lafayette. A long column of infantry closed the procession. After passing though the streets, and under thirteen triumphal arches, we halted and alighted before the state house. While we rested there a few moments, the city council, judiciary, and military officers, assembled in the principal hall, and a few minutes after, under a salute of thirteen guns, we were conducted into the Hall of Independence, and the general having been led to the foot of the statue of Washington, was impressively addressed by the mayor. In listening to this address, and recognizing this hall in which the declaration of independence of the United States was signed; this hall at whose door he had waited in 1777, with so much impatience to devote his life and fortune to an almost desperate cause, Lafayette felt an emotion he could scarcely conceal, and which several times showed itself in his eloquent answer. …As the General passed the United States Bank, the Patriots of ’76, each bearing his banner with 76 in large letters upon it, encountered his gaze. The effect was electrical. The Patriots cheered him as he passed, waving their banners, and the General rose, and saluted them most respectfully with three low bows. …After the General had been received by the Committee, he walked on the covered way prepared for him to the door of the Hall of Independence, the people rending the air with acclamations. – The hall has been fitted up in the most splendid manner. The Room is 40 feet square, the walls and ceiling painted a stone colour, the windows hung with scarlet and blue drapery studded with stars. In the east side stands a statue of the immortal Washington, in a recess which was formerly occupied by the Chair of the Speaker of the first Congress. Behind the statue there is an azure star drapery suspended from spears and wreaths. To the right and left of the statue hangs the Portraits of William Penn, Franklin, and Robert Morris and Francis Hopkinson. The intermediate spaces are filled with the Portraits of Greene, Wayne, Montgomery, Hamilton, Gates, Richambeau, Charles Carrol of Carrolton, and Gov. M’Kean. Over the door entrance is placed the celebrated Portrait of Washington by R. Peale, relieved on each side by crimson and azure drapery, suspended from spears and laurel wreaths. On the right and left of the entrance are placed the Portraits of Jefferson, Hancock, Adams, Madison, Monroe, and the venerable Charles Thompson – On the north and south the windows are draped to the floor with crimson and azure, the carpet of similar colours, and the furniture of mahogany tastefully and appropriately disposed. The General was introduced into the Hall so celebrated in our National Annals, amidst the reiterated and redoubted peals of joy from the multitude. We under the City Council have determined to remove the costly furniture with which the Hall of Independence was adorned for the suitable reception of the Nation’s Guest, and intend using the Hall, as at former elections, a receptacle for votes. If our information on this subject be correct, we cannot but regret, that a room so splendidly fitted up, should be despoiled of all its elegance, and converted into an election poll, when the convenience offered by the County and District Court Rooms, are equal if not greater for this purpose.